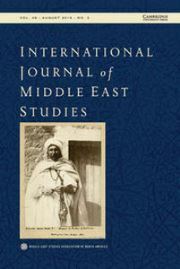 The International Journal of Middle East Studies (IJMES) publishes original research on politics, society, and culture in the Middle East from the seventh century to the present day. The journal also covers Spain, southeast Europe, parts of Africa, South Asia, and the former Soviet Union, as well as other regions, for subjects of relevance to the Middle East. Contributions are welcome from across disciplines, including anthropology, comparative religion, cultural studies, economics, history, law, literature, philosophy, politics, sociology, and theology. IJMES is a quarterly journal published by Cambridge University Press under the auspices of the Middle East Studies Association of North America. MESA members receive the journal as a benefit of their membership. Subscriptions are also available through Cambridge University Press. To claim a missing issue of IJMES, please complete the form found here.